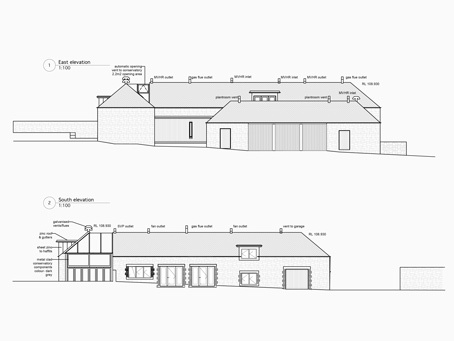 This was the complete rebuild of a former byre situated in a remote rural area with great aspects. The brief was a completely renewable structure that would be environmentally friendly from all aspects and totally sustainable. Key to the brief was maximising the use of indigenous materials within the site. The existing structure was underpinned and a new timber kit was constructed within the byre walls. Southern facing solar panels and ground source heat pumps were installed with pipework in the fields adjacent. Bird glass was used throughout the building. Large sections of the roof were formed from existing timbers collected on the farm. These were stripped, re-kilned treated and stress graded. The kitchen units were completely recycled timber from the farm. A new Victorian style walled garden created out of indigenous stone.